The works of the Swiss artist, Marc Jurt are featured in the exhibition entitled ‘Traces and Signs, Bali Resonance’ opened on July 19th, 1999 at Ganesha Gallery Four Seasons Resort Bali at Jimbaran Bay (phone 701010). Covering Europe, Asia, Africa, North and South America, Australia, Marc Jurt has presented 60 one-man shows, and 60 group shows, since 1973. Marc has come a long way from his studious and precise works of the 1980’s. From smaller works of he has moved to fabulous inner landscapes belonging to no one country but inspired by all. The Swiss artist, Marc Just is no stranger to Bali having first visited in 1980. One of his most notable works from the era is a self-portrait in a local restaurant, peering out at the viewer through binoculars. Appropriately it is entitled, “the observer”. His etching style has expand in size and composition, leaving large open spaces and various abstract swirls. Some show views of rice fields, corners of temples, and others offerings common Balinese themes. His works are not destined to become postcards though, rather complex reflections of Marc’s continuing personal experiences. Following Marc Jurt’s Exhibition, form the 23rd of August to 23rd of September the Ganesha Gallery will present Richard Winkler in “The Images of the Tropics in the Western Psyche’. The Swedish artist adds an intriguing twist to paradisiacal images. At first glance his canvasses might appear only to be studies in the rich verdure of the tropical plant world. The leaves of his plants are thick and full; some are tubular and resemble human bodies with spayed limbs. Next we are struck with an inherent sensuality if not eroticism. The allusions to the more intimate parts of the human body are self evident. Plants become animal or human like. Several paintings are pastoral scenes inspired directly by Bali and Balinese painting. In the background we see misty volcanoes, jungle and tumbling rice fields. Humans and animals can be found but ironically they resemble humanoid plants as much as they do their own species. It should surprise no one that Winkler’s chief hobby is gardening. A graduate of two arts schools in Stockholm he has worked as a successful freelance illustrator. In addition he maintained an independent painting career and has mounted six solo exhibitions since 1992. tired of the cold of his native land he set out to Bali in 1997 and ended up marrying an Indonesian woman and settling in Bali. When asked about the meaning of art to his life he answered, “Without art I have no life. For me art is emotional rather than intellectual”. 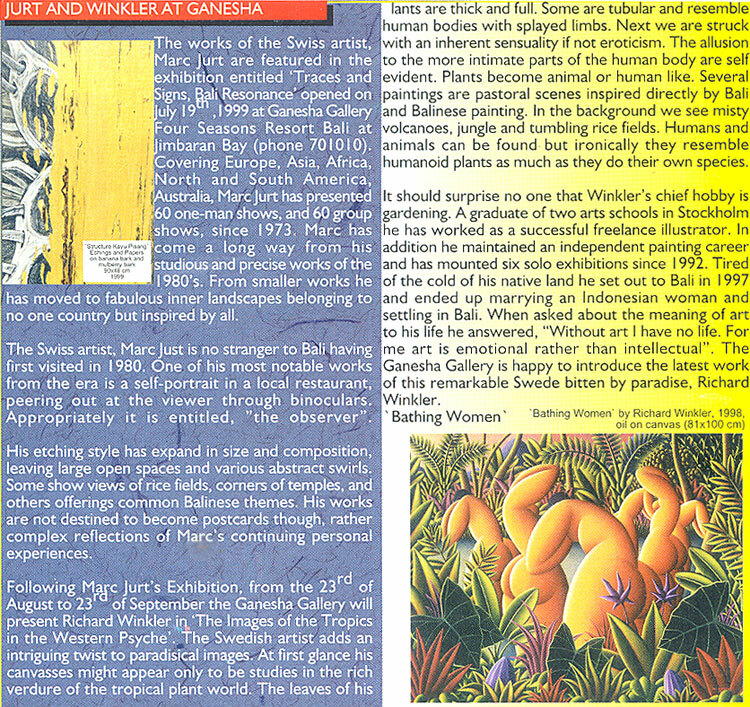 The Ganesha Gallery is happy to introduce the latest work of this remarkable Swede bitten by paradise, Richard Winkler.